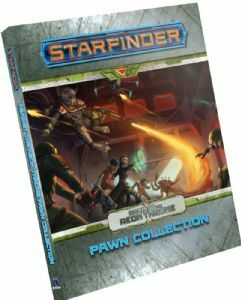 The characters, villains, and starships of the Against the Aeon Throne Adventure Path come alive on your tabletop with this collection of more than 100 creature and starship pawns, designed for use with the Starfinder Roleplaying Game or any tabletop science fantasy RPG. Printed on sturdy cardstock, each of these double-sided pawns slots into a size-appropriate plastic base from the Satrfinder Pawns Base Assortment, making them easy to mix with traditional metal or plastic miniatures. With dozens of distinct images, the Starfinder Against the Aeon Throne Pawn Collection depicts the enemies and allies from all three adventures of the Against the Aeon Throne Adventure Path.